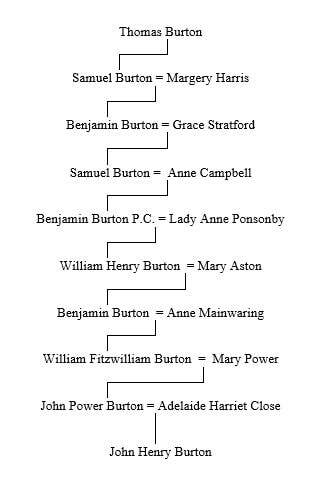 Burton Close Family - YouWho? had married Grace Stratford in 1686 – their children included Samuel and Charles. “Dame Grace Newenham to buy her mourning”. him in 1731, presumably to enable him to be closer to Dublin. Brabazon Ponsonby, the first Earl of Bessborough. Carlow in 1822, married Mary Power, the daughter of Sir John Power,1st Baronet of Kilfane, County Tipperary, in 1825. Sir Charles Burton’s great grandson, Charles Burton Newenham, and family, lived in Stillorgan from 1832 to 1837. ​Burton Hall Stillorgan (q.v.) was bought in 1863 by Henry Guinness and remained in the family until 1945.